have you ever heard of the expression, “rode hard and put away wet?” that is what tiddy saw when she looked in the mirror this morning. all of the late nights filled with wine and song have finally caught up with me. as i looked into my bloodshot eyes, i made a promise to myself: this week will be devoted to taking care of tiddy. and so it began with a 6 am wakeup, followed by a bowl of lucky charms and a cup of coffee (you have to crawl before you walk). mister ferguson and i have a grueling workout planned for this evening. P90X plyometrics! if you don’t know, you better ask somebody! i am also taking vitamins, drinking lots of water and have a spray tan and pedicure planned for later in the week. come friday, there will be a whole new sheriff in town! i would like to apologize to my readers for not posting yesterday. 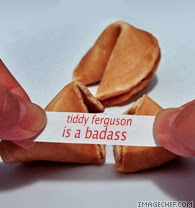 tiddy ferguson is only human. i got drunk on saturday night and decided I needed a little “hair of the dog” to get me through the day yesterday. unfortunately, hair of the dog turned into a full blown rager and I had to go to bed early last night. the weekend was a blast! mr. ferguson and i visited our new condo at seven springs and spent some time with rohm ’08, his brother and the adorable renzi family. thanks for the two buck chuck! i love it! Two Buck Chuck is the greatest wine ever. $3.99 for a fine bottle of Shiraz or Merlot...how can you beat it? Too bad it is only available across state lines. Tiddy has to make a trip to Cleveland and pick up a few cases.